‘In a gap in the hills, nigh Feather Tor and westerly of the Vixen, stands an old crooked granite post. The Windy-stone is seven feet high and from afar suggests some giant human figure bending forward as he tramps the desolation; but seen at hand this memorial of the Middle Ages resolves itself into the symbol of Christianity. Shaft and arms are octagonal and in fair preservation. Centuries of wild weather, flood, and frost, have driven the cross out of the perpendicular; time has fretted its angles; but still the grey stone, clad in venerable vesture of jade and black lichens; shall be seen to stand nobly on the heath. It glitters by day with the transparent quartz crystals that form part of its amorphous substance; and by night withdraws into a formless shadow against the sky‘, Eden Phillpotts, The Mother. When Crossing, (Crossing, 1987, pp.79 -80) mentions the cross being on, ‘an elevated plain‘ it can be further expanded by noting that the Windy Post stands at an altitude of roughly 985 (extremely exposed) feet which has lead to its very appropriate descriptive name. The alternative name of the ‘Beckamoor Cross’ refers to the small stream which flows about a third of a mile to the east, namely Beckamoor Water. Today the Windy Post’s vital statistics are; a height of 2.09 metres, a circumference of 1.01 metres and an arm span of 70 centimetres which are aligned in a west – east direction, (Sandles, 1997, p.116). 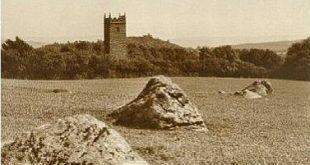 As noted by Phillpotts, the arms of the cross are octagonal with chamfered edges which according to Hemery, (1983, p.1009) gives it a unique facet among the stone crosses of Dartmoor. There is, albeit only faintly discernable today, an Ordnance surveyors bench mark cut into the face of the southern side of the shaft, roughly 46 cm up from the ground. This mark is certainly recorded on the Ordnance Survey 1:10,560 – Epoch 1 map of 1887 so it can be assumed that the damage was done over 121 years ago. Page, (1895, p.134) expands on Crossing’s theory when he cites (although he doesn’t mention from which book) that Crossing considered that the name Windy Post has ‘Celtic’ roots and is a derivation of the word ean which means ‘water’ which with the addition of a ‘y‘ later mutated to weany and then windy thus meaning ‘the post by the water’. In light of this, he suggests that the Windy Post may have marked an much earlier route than the medieval track which ran along the above alignment. The nearest to this notion I can get is the Anglo Saxon word wæt meaning ‘wet’ or wæter meaning ‘water’, (Clark Hall, 2004, p.395). Whilst the idea of an earlier track is plausible it does seem a bit far fetched to consider that it dated back to ‘Celtic’ times just because of a very tenuous etymological link? A very similar proposal is given by Harrison (2001, p.190) when he notes the water association coming from the place-name Beckamoor. The etymology of this name coming from bæc which means ‘brook’ (Clark Hall, p.31) and môr which indicates a ‘marsh’ or ‘wasteland’ (Clark Hall, p.240), thus giving -‘ brook of the marsh or wasteland’. There can be no possible argument for this idea, nobody can possibly tell if the cross was named after the brook or the brook after the cross, therefore putting a ‘Celtic’ date to an earlier cross or stone just because a nearby bæc has possible early English roots is crazy. Yes, the brook may have been recognised at an earlier date but that proves nothing as far as the cross is concerned. In all probability there has been too much read into the roots of the name and in fact it simply refers to the exposed and wind-blown nature of its locality as can be testified by anyone visiting there on a wild, stormy day. The Grimstone and Sortridge leat was probably constructed sometime in the sixteen century or possibly earlier, (Hemery, 1991, p.34). This does beg the question as to which came first? Was the cross erected after the construction of the leat or were the leat builders very respectful of the cross when cutting the channel, in which case they couldn’t have got much closer to it? In Peter Tavy churchyard is a grave which belongs to a member of the Fraser family and for whatever reason a virtually exact replica of the Windy Post stands at the head. The skill of the monumental mason is unquestionable as he even detailed the scars left on the original cross due to weathering, (Starkey, 1983, p.126). Should you wish to visit the Windy Post you are assured of a gentle stroll with wide ranging views. Simply park on the Tavistock to Princetown road (OS grid ref. SX 53382 75183) and follow the leat until it brings you to the cross. Whilst there have a look at the Bullseye Stone located in the leat which is a few feet away from the cross. Harrison, B. 2001. Dartmoor’s Stone Crosses. Tiverton: Devon Books. Page, J. Ll. W. 1895. An Exploration of Dartmoor. London: Seeley and Co. Ltd.
Starkey, F. H. 1983. Dartmoor Crosses and some Ancient Tracks. Privately published by F. H. Starkey.